Suppliers are required to maintain a quality control program that assures all supplies, processes, and services furnished conform to contractual requirements. PartsBadger Production LLC prefers that suppliers have a Quality Management System that conforms to the most recent revision of AS9100. In some cases, a QMS compliant to ISO 9001 or Nadcap will be acceptable. A supplier that does not have a QMS that is compliant to AS9100 or ISO 9001 will be placed on conditional approval status pending an evaluation of the quality system currently in place. Suppliers of special processes are required to be NADCAP accredited. Suppliers shall require direct and lower-tier suppliers to comply with quality assurance requirements comparable to those contained in these terms and conditions and on any Purchase Order. Supplier assumes responsibility for the quality of all procured material and workmanship. Our organization reserves the right to final approval of products, services, methods, processes, equipment and release of products and services. All special processes must be performed by competent persons. Communications should be handled through the buyer listed on the Purchase Order. Our organization reserves the right to control and monitor quality and delivery performance. Failure of a supplier to implement effective corrective actions can result in additional controls over the supplied product or the supplier, including, but not limited to; charge-backs, or additional inventory levels. If these controls are not effective, it can result in the supplier becoming unapproved. Our organization, or our customers reserve the right to perform verification or validation activities at the supplier’s facilities. Our organization reserves the right to approve or specify any design and development control, special requirements, critical items or key characteristics. Our organization reserves the right to designate requirements for test, inspection and verification (including production process verification), including the use of statistical techniques for product acceptance and related instructions for acceptance by the organization. supplier shall maintain on file all quality documentation for a minimum of 10 (ten) years or as required by contract. Calibration records must be retained for 10 (ten) years from completion of purchase order. Contact PartsBadger Production, LLC prior to disposition of quality records for disposition instructions. PartsBadger Production LLC reserves the right of access by our representative, our customers, and any regulatory authorities to the applicable areas of all facilities, at any level of the supply chain involved in the order and to applicable documentation. 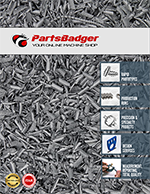 PartsBadger Production LLC suppliers are a critical part of our success. To supply top quality products and services responsibly, we understand and expect our suppliers will have an internal code of ethics and business conduct, best practices for enhancing product safety, and will maintain compliance with all laws and regulations applicable to your operation of business.